I mentioned in my intro post that I would post up about my CNC router project so here it is. Some background. 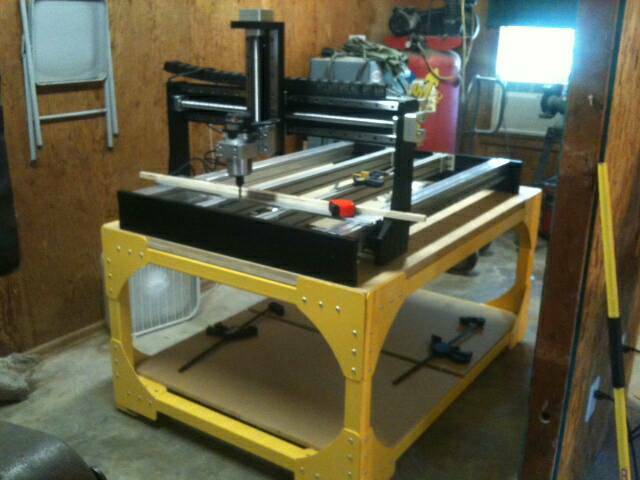 2 years ago I decided I would build myself a CNC router to allow me to make various components for the many projects I have going. I was not at a point in my life that I was excited about machining all the components required to build the mechanical portion so I elected to purchase a Predator model machine kit from XZero out of Canada. Basically you get all the components to build a machine of approximately 40” x 60”, minus all the electronics and such. The machine went together very quickly thanks to being a proven design with good engineering. I started my research for a control system and quickly realized I was going to have to use a PC based system. After a bunch of research I decided I would go with the EdingCNC control system out of the Netherlands. I procured a complete system from them and started collecting all the trinkets required to complete the control and motion systems. 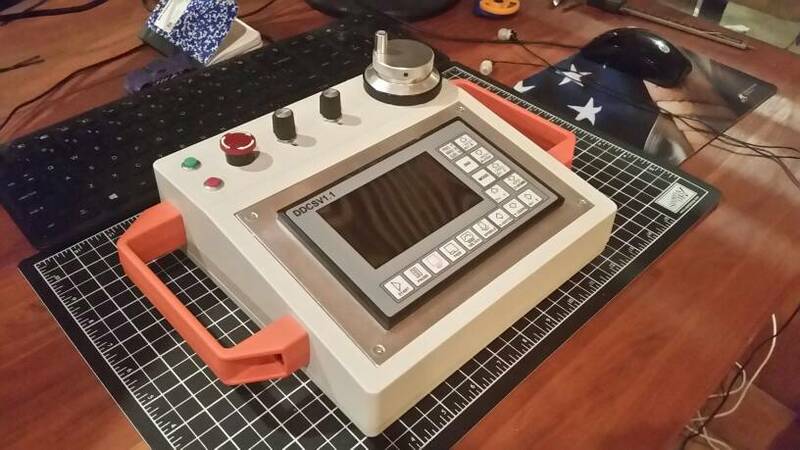 I had talked myself into adding many safety features like would be found on any commercial CNC machining center, and that is the reason my progressed stopped. I got completely overwhelmed with the crisscrossing systems and the various voltages required for specific systems, not to mention the complexity of the earth ground system to ensure there was not going to be any EMI. I shelved the project for two years, which disappointed my wife...who unbeknownst to me, already had a laundry list of projects ready for me to make on that machine. I was disappointed in myself as well. While bored at the dentist office a month or so ago, I browsed through the various websites on my Tapatalk cell phone app trying to find something to feed my mind. Enter MadModder. I quickly found the thread that was started about the DDCSV1.1 control system. I found it interesting, but I wasn't on fire yet. Just a day or two later there was a post there by a member named Jay McClellan. His post included a link to a video that outlined his build and showed the inner workings of his control system. I don't know what it was about that video, but just seeing how uncomplicated a system could be to start a project set me back on fire for my own CNC project. (Thanks a million Jay). 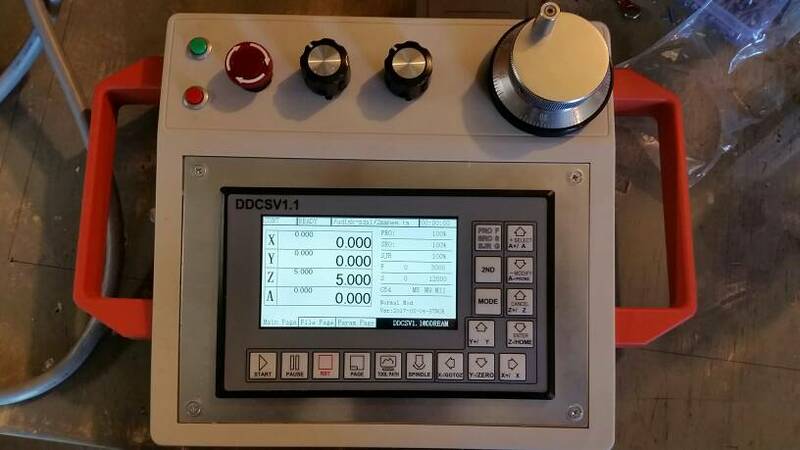 I immediately sourced a DDCSV1.1 of my own and built a wiring schematic that was so simple that it amazed me. Not being strapped to an old Windows XP version of a computer and dealing with all the problems that presented just continued to fuel my zest for this project. I really liked the control pendant in that video, but quickly realized I would not be able to cram all of my gear into the exact box Jay had. I am just not that neat and organized. I needed more room to work. I found a plastic project box online that I felt I could work with. Not a fan of plastic, but it is a start. I'll share a couple pictures of where I am in the progress and hope to have a running machine in the next week or so. I will continue to post progress reports here as I go. For some reason I cannot post photos from my desktop directly from the website. I'm trying from my phone so I hope it works. I hooked up the servos and all seems to be well. My NPN limit sensors will not work on this PNP system so I ordered a new set. Should be here in a couple of days. Until then I will clean up the layer of dust on the machine and finish laying out all the wires and making widgets as required. I will admit that the wiring of this system takes a lot longer than I had anticipated. Good thing is my wife is very patient with me. Posting from my phone again. Still have not sorted out my desktop posting issue. Looks nice and clean. I am impressed. I am still on the fence about the DDCSV1.1. I am tired of using an old laptop with Win98 on it... praying it doesn't die. It will eventually... Please, let us know how you like using it.